Come out and join us for the second annual Fishing for the Future Tournament on February 14th, 2015 at VanEtten Lake. This tournament is a fundraiser designed to generate funds to help the Conservation District continue to benefit the community by providing a myriad of programs and events as well as helping lessen the cost of tree plantings to local residents. Participants can purchase up to 3 pre-drilled holes for $20 apiece before the tournament and $25 the day of. Prizes will be awarded to the top ten heaviest fish for adults and the top ten for kids as well. Check out all the rules and regs below. There will be a ton of random giveaways so no need to catch a fish to win. The tournament day will be filled with food and fun for all and plenty of surprises! Crusecom is passionate about helping encourage our youth to enjoy the great outdoors and live healthy drug free lifestyles. We here at the Conservation Districts couldn't agree more and we would like to sincerely thank Crusecom for their support! 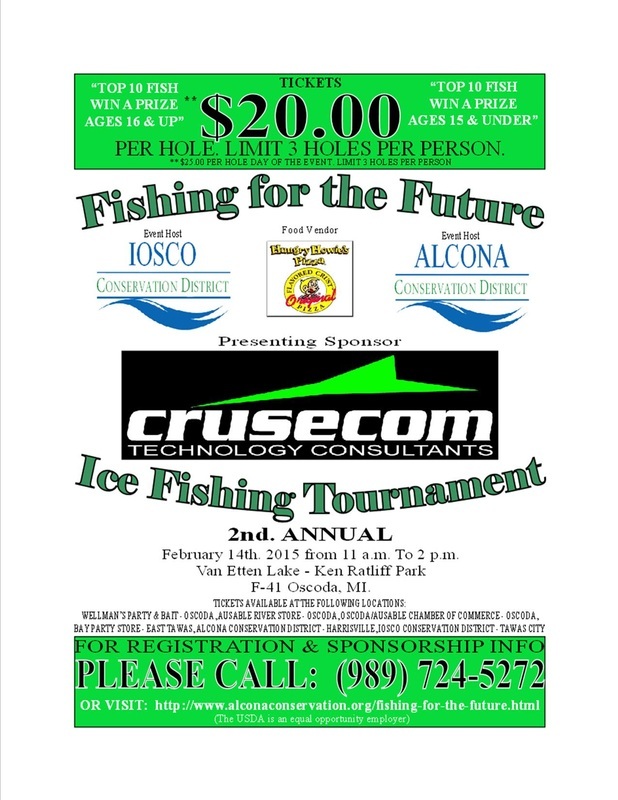 Alcona and Iosco Conservations Districts are excited to announce the second annual Fishing for the Future Ice Fishing Tournament! The Tournament will be held on Saturday, February 14, 2015 on VanEtten Lake from 10 am - 2 pm. This tournament supports the work of Alcona and Iosco Conservation Districts.